It is difficult when you look at a complex scene to know what to sketch. 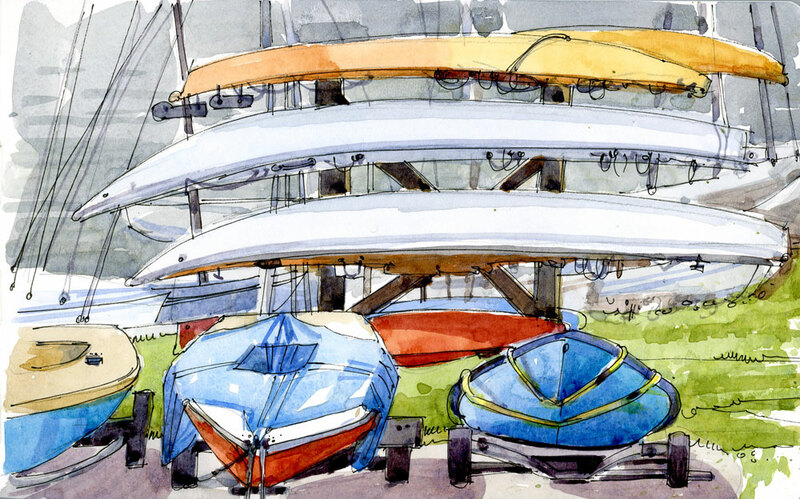 This morning I sat on the steps near the Venture Sailing Club in Pointe Claire, drinking my coffee and contemplating what to paint. When I am in my car the scene that I paint is often obvious because it is framed for me by my front windshield but when I am out of the car there’s so much more to choose from — a big vista in front of me. Today I had the lake as a backdrop, boats in the water as well as on land and a red building on a hill to my right. I started several sketches but none of them had any focus. In the end I decided to simplify and chose three boats on the ground and three in the air. There was plenty going on the background too — a crisscross of masts and boats on the shoreline but I tried my best to just hint at that. Love the boats… I’m happy for you to paint as many boat scenes as you want. I would have to be a leftie in your part of the world. On second thought, if I lived in Australia I would never paint in the car! fantastic work…I’m new to your blog and truly enjoying it!! Welcome Ellen. Glad to hear from you. I don’t know boats that well but I thought those might be lasers. Thanks! If you can enjoy them every day, then it’s my pleasure Gary. One of the things I love most about your sketches is the choice of composition you make and the elements you draw. Little bits and parts of bigger elements that work together. I can never make those decisions in my sketches. Congratulations on your blog. I am becoming a fan! Thank you so much Filipe.